In my efforts to spread the good news of Linux, I have been installing openSUSE Leap for anyone that says, “hey, can you fix my computer?” I tell them, sure, but I only do Linux and generally, that works out just fine for most users. Thanks (or not) to Chrome and web applications the need for Windows has decreased substantially. Web applications are more common which reduces the need for a specific underlying operating system. One particular Laptop with which I helped a friend out was particularly interesting to me. This HP Stream 11 is nothing remarkable in respect to the hardware. It is a very basic, inexpensive computer that doesn’t have great specs but the build quality is real nice. It feels solid, keyboard is nice and the screen, although, not super high resolution, is also very acceptable. For more about the hardware, see the full Hardware specifications of the laptop can be found here. Two general paths, Dual-boot or straight openSUSE Linux… really no choice as the Windows installation was completely non-functional. Despite the foreknowledge that the computer “didn’t work” I wanted to give it a spin to see. To my surprise, it started up fine but every program I tried to open gave a cryptic error and it was unable to do… well… anything but sit there and look pretty. I could have probably taken the time to figure out what went wrong… but really.. why? My initial concern, based on the specifications from HP was that it just wouldn’t have the “horsepower” to run a full featured KDE Plasma Desktop Environment. Regardless, I was going to give it a whirl and see what I thought of it. Quick hardware review identified the only questionable piece of hardware would be the wireless interface. Fortunately, this machine had a Realtek WiFi driver that was already automatically supported by the kernel. Thankfully no slight-of-hand required to get it working. I already had openSUSE Leap 42.2 on a USB Flash drive ready to install and the process was completely painless. There no need to set any special kernel parameters for video or hardware discovery issues. This machine has UEFI enabled by default. I didn’t want to mess with it, perhaps because I’m lazy, so I enabled legacy support and set the boot order to have the USB device boot first. To begin, shut down your Stream 11… a REAL shutdown, not suspend to RAM or hibernate that the installed OS might kick you into. Before you start it up again, get your finger ready on the Escape key (upper-left-most key). It’s a very small window in which you can press the escape key while booting up to enter the boot options. Once the menu appears, press F10 to enter BIOS Setup. That will take you to the hardware level interaction with the system. Don’t mess around here too much unless you know what you are doing but if you DO mess it up, you can reset it to defaults so, no worries. Using the arrow keys, arrow over to the System Configurations. Arrow down to Legacy Support to change to Enable. Next you need to arrow down to Legacy Boot Order and move USB Diskette on Key/USB Hard Disk to the top of that list. Commit to the changes, save and exit, ensure the USB Drive with openSUSE Leap is plugged in and reboot the system. Go through the installation process and make sure that you use the entire disk for you openSUSE installation. I am sure that the automatic partitioning setup is fine for most people but I like to have a bit more SWAP space available due to the limited available RAM (only 2 Gbytes). The limited available storage (hard disk / SSD) space is limited as well so I used XFS instead of BTRFS due to the snapshots chewing up memory and I didn’t want to have to manually go in and delete snapshots from time to time. For specifics on how to use set up the disk. Refer to the openSUSE Leap documentation on Advanced Disk Setup. – 14.11 GB (all that’s left) for the Home (/home) partition. Commit to the installation process, sit and enjoy the show or come back later. You shouldn’t have any issues whatsoever. This machine is surprisingly snappy for it’s lack-luster specifications. KDE was not sluggish at all, it worked well without any lagging or strange screen artifacts. I installed my typical Base Applications that I do for all openSUSE setups, had no issues with VLC or Chrome. I signed into Netflix to see if it would have any lagging issues but alas, not one glitch or hiccup. It flawlessly worked and was smooth as silk. For a simple computer to do mostly web based tasks or office type activities, this system is perfect. I wouldn’t use this if you run any memory intensive programs that push the limits of a computer. Now, some things I DON’T like about this computer. First, there is no Ethernet port available. Realistically, I think that MOST users would not need this anyway. I personally like to have one as I don’t really trust the reliability of wireless networks… still… On the other hand, you aren’t likely going to do anything with this computer that would require such high levels of quality of service from the network that a wired connection is necessary. The screen resolution is a bit low for my liking. At 1366×768 is a bit low for me these days… would be amazing 15 years ago but today, just a little low. I would prefer nothing less than 1600×900 but I really am splitting hairs here. If I would be using this to do office and web based activities so it really is adequate, especially for the approximately $200 price tag new. Top row Media keys default instead of Function Keys. This is more and more common but I find that the default setup is annoying to not have the function keys be the default input. I am probably in the minority on that so for likely everybody else, this won’t be a problem. No optical drive but that is kind of a thing of the past that I cling onto. I don’t expect it to have this but I just happen to still play DVDs from time to time. NOT a big deal at all, I just wish it had it. Tablets and phones are mostly useless when it comes to content creation, at least, that is the case from my perspective. You can add a case with a keyboard that has a kickstand to a tablet but that is WAY less useful than a real laptop. A nice lightweight laptop like this is a great step up from a tablet+keyboard setup. What I really like about this laptop and a few others in this class of compact, lower spec systems with full sized keyboards is that it is solid and very well built. It may be cheap but it doesn’t feel cheap, I can take it with me and not worry about the consequences of it getting destroyed and I can actually get work done with it. The battery life is also very good and the suspending and resume cycle is very fast, on par with a smartphone. Overall, my experience with this machine is very positive. openSUSE Leap with KDE Plasma Desktop is a great fit for this hardware. 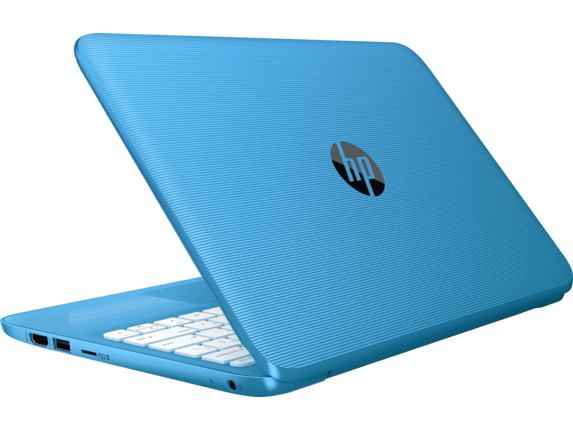 I would recommend the HP Stream 11 with openSUSE for anyone in need of a basic machine or something that is a step up from a Chromebook. This system is a great fit for any situation where ChromeOS is just not enough.